Chocolate Chip Shortbread Cookies. The easiest cookie recipe ever! 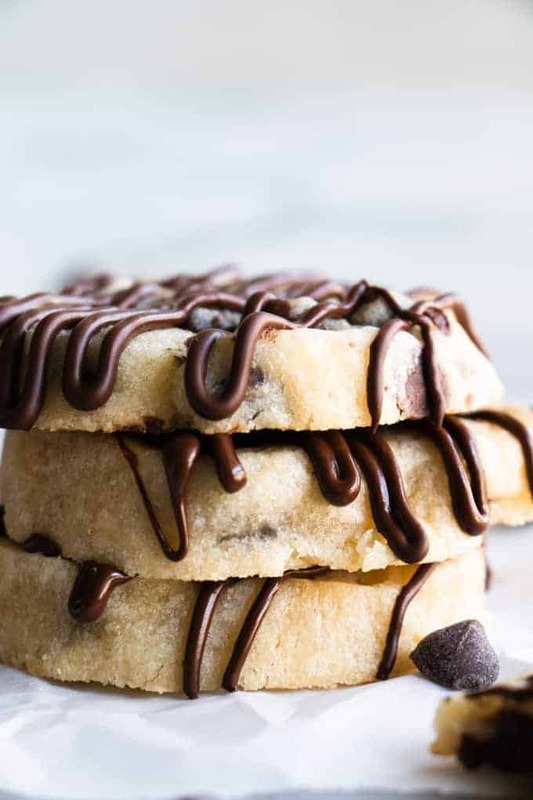 These shortbread cookies are soft, buttery, and loaded with chocolate chips. Drizzle with a little extra chocolate for the ultimate cookie treat. These will disappear fast! In a large mixing bowl add the room temperature butter, sugar, and salt. Beat or mix together until combined. Add in the vanilla extract and egg. Mix to combine. Stir in the all purpose flour. Press the dough together with your hands. Fold in the chocolate chips. Lay a piece of plastic wrap on the counter. Place the cookie dough on the plastic wrap. Using the plastic wrap, roll the dough into a long round shape. Roll it against the counter to get the dough compact and round. Make sure the cookie dough is completely wrapped in the plastic wrap and place in the fridge to chill. Chill the cookie dough for at least 2 hours. Preheat the oven to 350 degrees. Remove the cookie dough from the refrigerator and remove the plastic wrap. Using a large knife slice the cookie dough into ½ inch rounds. Place the shortbread cookie rounds on a large baking sheet that is lined with a silicone baking mat or parchment paper. Press the edges of the cookies in to smooth out from cutting. Bake the cookies for about 12-14 minutes until cooked through. Cookies will be slightly golden on the outside. They will not spread much or rise. Allow cookies to cool, then drizzle with additional melted chocolate as desired. Store the cookies in sealed containers at room temperature.